The Battle of Savannah, Georgia which occurred between September 16 and October 18, 1779, became one of the bloodiest battles during the American Revolutionary War. At the time British forces numbering 3,200 troops had occupied Savannah, then the capital of Georgia, for the past year. They were challenged by 600 Continental troops led by General Benjamin Lincoln who were supported by 3,500 Frenchsoldiers led by First Lieutenant Count d’Estaing including 800 troops from Saint-Domingue (later Haiti) and other French Caribbean colonies. The French had agreed to ally with the American Revolutionary forces following the Royal ordinance issued by Louis XVI, the King of France, on March 12, 1779. D’Estaing’s troops were mainly composed of colonial regiments coming from various locations such as Guadeloupe, Martinique, or Saint-Domingue (future Haiti). The 800 men from the French Caribbean colonies were organized into a regiment called Chasseurs-Volontaires de Saint-Domingue. These soldiers were des gens de couleurs libres (free men of color) who voluntarily joined the French colonial forces. The gens de couleur were mixed-race men of African and European origin from Saint-Domingue. They were born free and thus were distinct from free slaves or affranchis, who were born enslaved or became enslaved during their lives and then freed themselves or were freed. This distinction allowed the gens de couleur a higher social and political in the French colonial West Indies. According to the 1685 French Black Code, they had the same rights and privileges as the white colonial population. In practice, however, strong discrimination by white French colonial residents impeded the gens de couleurs from fully exercising them. Nevertheless, due to their in-between status some of them joined the Chasseurs-Volontaires formed after the March 12, 1779 royal ordinance and thus became part of the French command which supported the Continental army in Savannah. In fact, the gens de couleurs outnumbered the 500 American troops at the Battle of Savannah. Their role in the battle was also significant because they were sent in scout before the beginning of the hostilities on September 8, 1779. During the course of the battle, they were considered as one of the most homogeneous and efficient allied group, fighting the English troops with obstinacy and boldness. But the knowledge the British had concerning the attacking plan of the American side, due to a leak of information given by American deserters, impeded any chance of victory to exist. Due to their loyalty to their commander, the Lieutenant Count d’Estaing, and to their dedication in combat, the Chasseurs-Volontaires military group represented a large part of the 168 killed and 411 wounded soldiers in the French ranks following the battle. 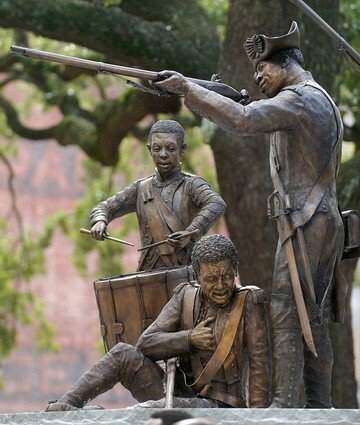 On October 8th 2007, a memorial statute was unveiled in Savannah dedicated to the Chasseurs-Volontaires de Saint-Domingue during the 1779 battle. The memorial pays tribute to the significant role these soldiers had during the Revolutionary War and recognizes the support they gave to the founding of the American society. G. Debien, « Gens de couleur libres et colons de Saint-Domingue devant la Constituante (1789 mars 1790) » Revue d’histoire de l’Amérique française, 1950, 211–232 ; Clément Lanier, « Les Nègres D’Haïti Dans la Guerre d’Indépendance Américaine,» Revue du Temps, n°52, July 1st 1933 ; Nikki White, « Haïtien Mémorial Monument Celebration », August 9, 2016, posted on Savannah official website: http://www.savannah.com/events/event/haitian-memorial-monument-celebration/.